The Old City of Jerusalem has within its walls holy places central to Judaism, Christianity and Islam. These include the Western Wall, built by King Solomon in the tenth century BCE as a retaining wall to support the Temple Mount; the Church of the Holy Sepulchre, commenced in the fourth century CE under the Emperor Constantine; and the Dome of the Rock and the Al Aqsa Mosque, built after the conquest of Jerusalem by the Caliph Omar in the seventh century. The proximity of these sites reflects the close historical and doctrinal relationship between the three monotheistic religions. The detailed history of ancient Israel is recorded in the Hebrew Bible (called the ‘Old Testament’ by Christians). The biblical history of the Jewish people begins when Abraham is told to travel to the Promised Land, “the land I will show you”. “By the rivers of Babylon, there we sat down, and we wept, when we remembered Zion. How shall we sing the Lord’s song in a foreign land? If I forget thee, O Jerusalem, let my right hand wither. Let my tongue cleave to the roof of my mouth, if I remember thee not; if I set not Jerusalem above my chiefest joy” (Psalms 137:1-6). 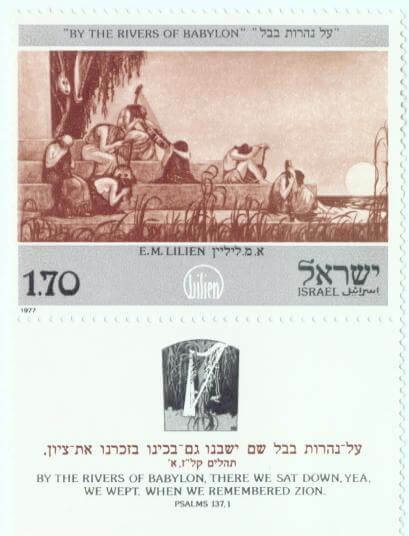 Israeli stamp "By the Rivers of Babylon"
In the fifth century BCE the Second Temple was built. In 169 BCE it was desecrated by the Syrians in the cause of Hellenism, and in 165 BCE it was rededicated by the Maccabees, after they defeated the Macedonian-Greek rulers of Syria in a guerilla war. After 4 BCE, with massive building by Herod “the Great”, the Temple again became one of the great wonders of the ancient world. The Romans destroyed this Second Temple in 70 CE, and for them it was a victory of such significance that they commemorated it by erecting the triumphal Arch of Titus, which still dominates the Roman Forum, with a frieze showing a triumphal Roman legion carrying the Temple treasures. Detail from the Arch of Titus showing the Temple Menorah being carried in the triumphal procession in Rome. When the Emperor Hadrian began planning to replace the destroyed Second Temple with a shrine to Jupiter, a Jewish revolt known as the Bar Kochba Rebellion broke out. In the subsequent revolt in 135 CE, according to the Roman historian Cassius Dio, some 580,000 Jewish soldiers were killed. Following that revolt, Hadrian decreed that the name ‘Judea’ should be replaced by ‘Syria Palestina’ – Philistine Syria, or ‘Palestine’. Jerusalem was razed to the ground and symbolically ploughed, the Roman shrine was built, and the name of the city was changed to Aelia Capitolina. In the years following the destruction of Jerusalem, the greater part of the Jewish population was sent into exile as captives, slaves and refugees, although Galilee remained a centre of Jewish learning and institutions until the sixth century CE. For the past 2,000 years, on the 9th day of the Hebrew month of Av, Jews everywhere have commemorated the destruction of the city and the Temple with a 25-hour fast. They sit on low stools in their synagogues and recite Jeremiah’s Lamentations. They recite elegies for the city which is “scorned without her glory”. Jerusalem’s famous Western Wall, the ancient retaining wall of the Temple Mount, remains today in the centre of the Old City of Jerusalem, as a place of prayer and remembrance. Meanwhile the site of the Temple itself, on the surface of the Mount above the Wall, is currently occupied by the Islamic Dome of the Rock, constructed by the Caliph Omar in the 7th century CE. The rock on Mount Moriah – the Temple Mount – is the rock from which Mohammed ascended to heaven on horseback, which is the same rock which was the scene of the “binding of Isaac” in Genesis. The United Nations Partition Plan of 1947 envisaged an Arab and a Jewish state in economic union, together with an internationalised Jerusalem. Palestine’s Jews accepted the Partition Resolution and established the state of Israel. Palestine’s Arabs rejected this ‘two state solution’ and refused to set up a provisional government, and the armies of the Arab League attacked immediately after Israel’s Declaration of Independence in 1948. In the armistice agreements which followed that war, Jerusalem was divided. West Jerusalem was held by Israel. East Jerusalem, including the Old City and the holy places, was part of the territory annexed by the Kingdom of Trans-Jordan, which was then renamed ‘Jordan’. In 1967 Jordan joined Egypt and Syria in a coalition aimed again at the destruction of Israel, and its army joined the forces massed on Israel’s borders. In the ‘Six-Day War’ which followed, East Jerusalem was retaken by Israel, and Israel claimed sovereignty over a re-united Jerusalem. Under Article 8 of the Israeli-Jordanian Armistice agreement of April 1949, free access to the Western Wall and Mount Scopus was guaranteed to the followers of all religions. However, between 1948 and 1967, under the rule of Jordan in East Jerusalem, 54 synagogues were destroyed in the Old City; gravestones from the ancient Jewish cemetery on the Mount of Olives were used as paving stones; and Jews were expelled from the sector. 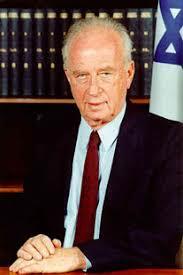 Immediately after the Israeli reunification of Jerusalem, the Protection of Holy Places Law was passed by the Knesset on 22 June 1967, guaranteeing the sanctity of all religious sites, including the holy places of Christianity and Islam. This law imposes prison sentences of up to seven years on those who desecrate such places. The 1980 Basic Law on Jerusalem as the capital of Israel reaffirmed the principle of free access to the holy sites of all religions. Israel permits Christians and Muslims to administer their own holy places and institutions. Jordan still administers the Muslim holy sites in the city, and the October 1994 Israel-Jordanian peace treaty agreed to respect “the present special role of the Hashemite Kingdom of Jordan in the Muslim holy shrines in Jerusalem”. ” Three thousand years of dreams and prayers today wrap Jerusalem in love and bring close Jews of every generation – from the fires of the Inquisition to the ovens of Auschwitz, and from all corners of the earth – from Yemen to Poland.